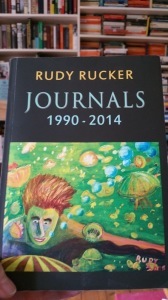 This is my copy of Rudy Rucker’s Journals. It arrived last Friday. Strictly speaking, it arrived on the Wednesday but I wasn’t at home and the postman couldn’t get it through the letter box so took it back to the sorting office, from where I finally collected it on Friday morning. The picture on the cover is from a painting by Rucker called Jellyfish Lake from 2005. Rucker launched a Kickstarter to get his Journals published and I was happy to contribute. In addition to the thick and lovingly crafted paperback, I also got access to a huge range of digital goodies from Rucker’s back list. From essays and stories to novels and paintings, I now have a pretty wide selection of Ruckernalia to peruse at my leisure. And because I don’t have that much leisure these days, I’ll have to set aside Rucker-time especially. You can see the inside cover of my copy on the right. 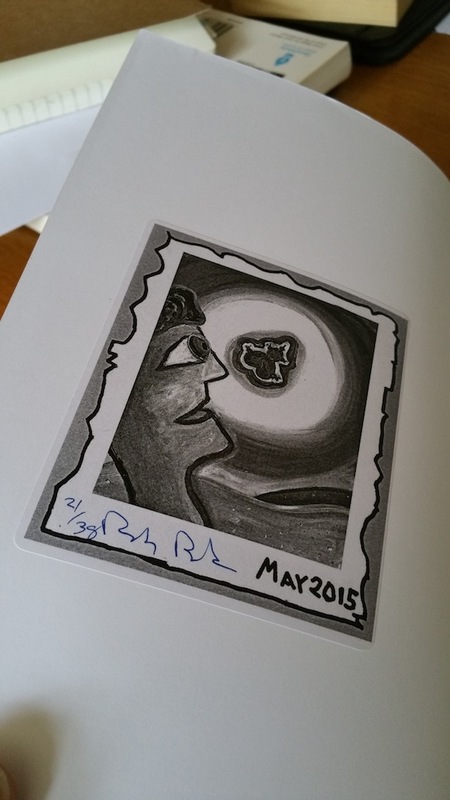 Rudy Rucker has attached a label showing the copy number. 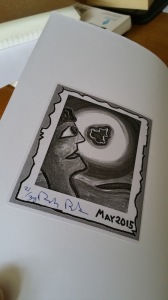 I’m also pleased to see that his signature makes mine look almost legible. Stuck inside the paperback, by the way, was a draft story with all the corrections and annotations marked on the draft. Again, it’s refreshing to see in the scrawled edits evidence of handwriting that is as spidery and alien as my own. On the recommendation of Euan Semple, I got hold of “Teach Yourself: Improve Your Handwriting” but my hand, arm, and brain are conspiring to refuse to improve. The Journals are now beside my bed and I look forward to dipping into them judiciously at the end of every day. I have 25 years of Ruckerness to read through.